Located in the heartland of Mexico, the vibrant city of Guanajuato is a UNESCO World Heritage site with a quintessential colonial era charm. With its cobbled alleyways, plazas and cafes with a distinct European flavour, this former silver mining town is also referred to as the cradle of Mexican independence. Guanajuato had once been home to one of the most prosperous and productive silver mines in the world. Today, the city is famous as the birth place of famous Mexican artist Diego Rivera, for its music scene, its performing arts festivals, its theatres as well as its delicious local cuisine. In terms of topography, the state of Guanajuato can be broadly categorised into three different regions- Sierra Madre Oriental, the Mexican Plateau as well as the Trans-Mexican Volcanic Belt. 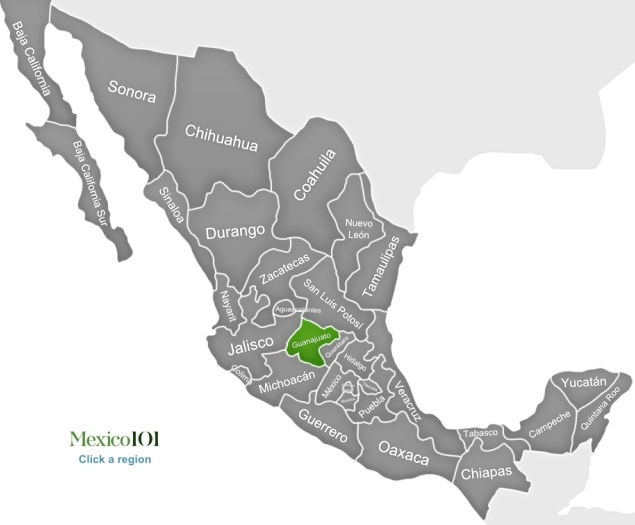 The Mexican Plateau runs through the centre of the state and the volcanic belt lies to its south. The plateau region mostly consists of low lying hills and rolling flat lands. The low lying flat lands around River Lerma and its territories is called Bajio (the word “bajo” translates to “low”) and is one of the distinctive features of the state’s topography. Despite its relatively high altitude, Guanajuato experiences a semi-arid climate that characterises most of the country. Temperature variation varies throughout the state, with arid lands being characterised by grasslands and higher regions experiencing greater amounts of precipitation. Due to the unique topographic and climatic distributions, the state is home to rich and varied flora and fauna. Historically, Guanajuato had been an important mining centre. Due to its central location, even today the state has access to established infrastructure as well as equal access to both the Pacific Ocean and Gulf of Mexico. Thus, the economy of the state is robust and it experiences major industrial activity. The Manufacturing sector contributes a lion’s share to the region’s impressive GDP followed by the mining, commerce and financial sectors. Agriculture, forestry, fishing as well the tourism industries are major avenues of income as well. Guanajuato is famous for its narrow and winding alleys. In the famous Alley of Kiss which is just over two feet in width, couples can even kiss across opposite balconies. Other famous attractions include the Cristo Rey Shrine where thousands of pilgrims descend every January to celebrate the Epiphany, the El Pipila and the rather macabre Museo de las Momias or Museum of the Mummies. Organised tours of the once prosperous La Valenciana mines is also popular. The residence of Diego Rivera has been transformed into a brilliant Museum displaying wonderful specimens of Mexican art. Another huge attraction is the annual Cervantes festival which is celebrated every year with much fanfare, concerts, live performances and theatrical feats.